Join our first ever Christmas Craft Contest by clicking HERE. Whether you are looking for ornate craft ideas from the worlds finest craftsmen, or simple paper crafts for kids, we have step by step instructions to help you with your project. Choose from various Christmas craft types or themes to find your perfect project. We are constantly adding crafts to our site, and welcome your ideas. If you would like to join our community of Top Crafters, or have your project considered in our Christmas Craft Hall of Fame, then please contact us. Otherwise, make yourself at home and be a part of a growing community of fellow crafters. 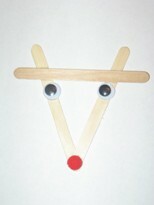 And be sure to check back with us each week as our collection of Christmas craft projects continues to grow. This craft was created with a chenille stem and red pony beads wrapped around a pencil and then formed into the shape of a wreath. You'll hear Christmas everywhere you turn with these easy to make jingle bell creations.